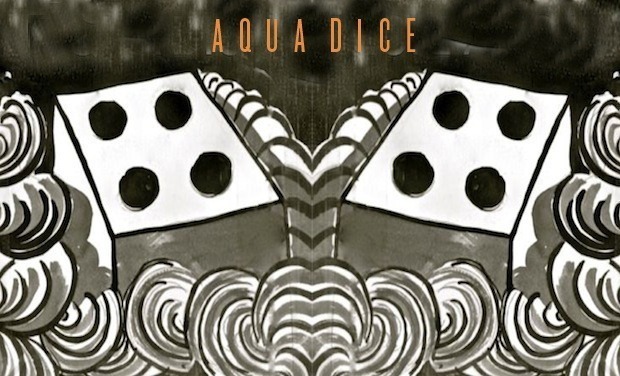 Aqua Dice is a kinetic ocean going sculpture celebrating Chance and Luck on the High Seas. Aqua Dice, in association with Fortune Cubed, is a kinetic sculpture consisting of two large sea going dice (9 m3) that will be launched into the Atlantic Ocean from the Canary Islands sometime between the 25th and the 30th of November 2012, weather permitting. Designed to be unstable the dice will be pushed by the wind and rolled by the ocean’s waves and currents. They will probably cross the Atlantic propelled only by natural forces. This ode to luck sung on the high seas will follow the same path that explorers, slaves and immigrants, their fates vitally intertwined, followed to the New World hundreds of years ago. What were the ships these people were traveling on if not giant dice rolling their way towards new frontiers? Aqua Dice is also a celebration of pure chance. There is no mathematical model in the world that can predict the outcomes or the destinations of these dice rolling on the ocean. Each die will be equipped with electronic beacons so that it may be easily followed by satellite. The dice will pose virtually no threat to navigation ( I can provide more details about this if necessary). 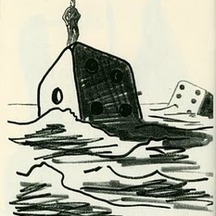 Aqua Dice was inspired in part by the poetry of the Frenchmen Mallarme and his work “ A Roll of The Dice Will Never Abolish Chance” and Rimbaud’s work “The Drunken Ship”. It is also inspired by my many years of sailing and my sculptural works that not only speak of the sea but are installed there. Below is a sample of such work. 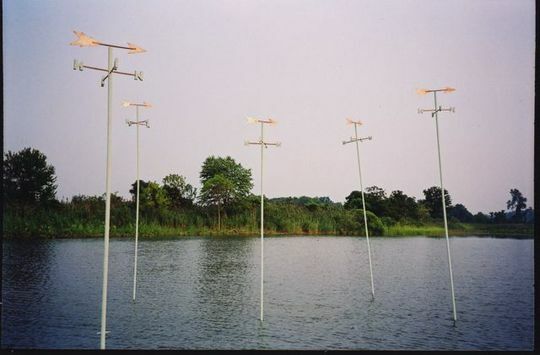 This piece was entitled Drift Pedestal and was set into the Gulf Stream off of the coast of New England in 2008. Aqua Dice will be carrying cargo. This will include bottled water from the Teror Water Company, and Tovarich Vodka as well as copies of the poems that inspired this voyage. In addition to Mallarme's and Rimbaud's works will be Dice Man by Luke Rhinehart and The Number and The Mermaid by Quentin Meillassoux. Of course there will be the crew list onboard naming all the patrons, such as yourself perhaps, of Aqua Dice. Aqua Dice needs to raise funds in order to pay for shipment down to its launch site in the Canary Islands. We need to launch from the Canaries so that the dice will catch The Trade Winds which will blow them across the sea. To date a generous grant from the French Ministry of Culture enabled the design and construction of the dice. We now need to raise 5000 euros so that Aqua Dice can make its big splash. The funds will be used specifically to ship Aqua Dice from France to the Canary Islands by cargo ship as well as to cover all the associated costs such as port fees, customs, permits, transport in and around the Canary Islands and the logistics of those last few long meters down to the water's edge. It will be the first time that I have ever tried to raise money with the public's help. Aqua Dice is built and ready to go. Deckhand. Welcome aboard. Your name and rank will be added to the crewlist. Petty Officer. Welcome aboard! Your name and rank will be adeed to the crew list. Master Chief Petty. Welcome aboard! Your name and rank are will be added to the crewlist. Ensign. Welcome aboard! Your name and rank will be added to the crew list. This list will be in the holds of Aqua Dice. Lieutenant. Welcome aboard! Your name and rank will be added to the crewlist. In addition you will receive an A5 print from the artist. Lieutenant commander. Welcome aboard! Your name and rank are on the crewlist. You get an A5 print with a dice sketch from the artist. Commander. Welcome aboard! Your name and rank are on the crewlist and you get an A4 print from the artist. Captain. Welcome aboard! Your name and rank are on the crewlist. Plus you get an A4 and A5 print from the Artist. Amiral al Bahr. Welcome aboard! Your name and rank are at the head of the crewlist. In addition you get an original drawing, an A4 and an A5 print. You get a jar of homemade marmalade too. The first donor can name one of the dice!